Preheat oven to 300° F. Prepare barbecue for indirect heat if using charcoals. Soak your choice of wood smoke chips in water and prepare a smoker vessel for the barbecue. Whisk all ingredients together in a small mixing bowl; cover airtight and set aside. Line a large rimmed sheet pan twice with aluminum foil in opposite directions leaving long ends to overhang the pan; set aside. Rinse ribs and pat them dry. Remove silver skin from undersides if desired. Generously rub all sides and ends of the meat with the spice mixture making sure to work it into the ribs. Transfer ribs to the prepared pan. Draw the overhanging foil up and cover the ribs tight to seal. Bake the ribs for 2 hours. In a food processor or blender, add the first 6 ingredients; blend until the berries are pureed. If using, add the salt. Add the hot sauce and stir. Transfer glaze to a saucepan. Over low heat bring to a simmer to reduce and slightly thicken; about 10-15 minutes. Set aside until ready to use. If using a charcoal grill, get the coals going about the last 30 minutes of baking; for a gas grill preheat one burner (right or left side) for indirect method when there’s 10 minutes baking remaining. In either case set the smoker chips over the heat source at this time. Transfer the ribs outdoors to the heated barbecue when the wood chips are smoking. Allow ribs to continue cooking for 20 minutes, turning as needed to caramelize. Baste the ribs one side at a time, turning them glazed side down to cook for about 10 minutes; the glaze will thicken and become sticky. Repeat for the opposite side. 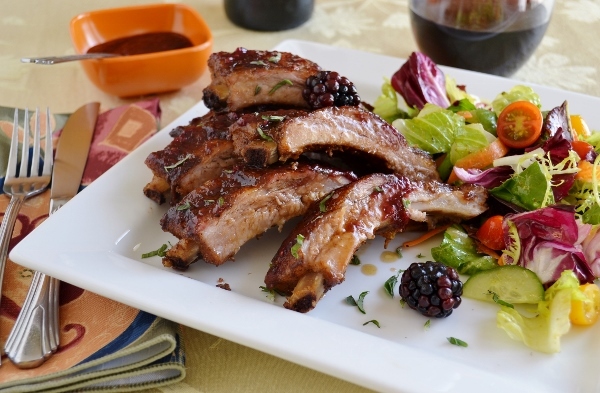 Transfer ribs to a serving platter and garnish with a few fresh blackberries and thinly sliced scallions or minced fresh parsley. Notes: It may seem the measure of fresh ginger is abundant, but in simmering the glaze on the stove top, it mellows the ginger while leaving its bright note intact. Feel free to use your favorite brand of hot sauce for the glaze. Both the glaze and the rub are ideal to use for beef and poultry.